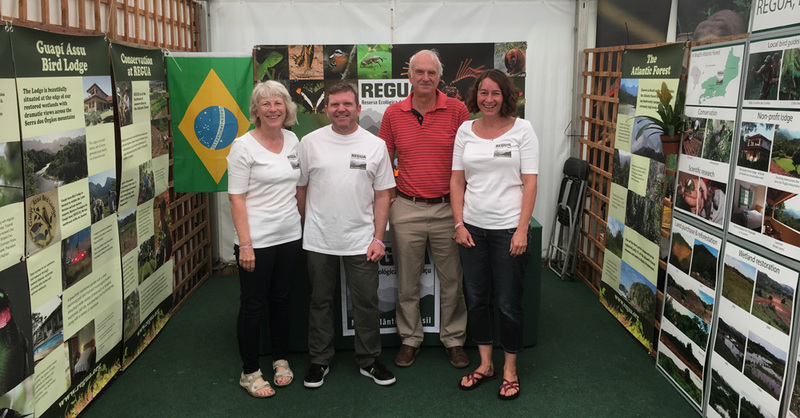 This was the 12th year in a row that REGUA has attended the British Birdwatching Fair, and what a successful Birdfair it was! Held each year at Egleton Nature Reserve at Rutland Water in England, the Birdfair is the world’s largest conservation fundraising fair and this year (the 30th Birdfair) is helping to fund the creation of the Ansenuza National Park in Argentina. Our stand was once again organized and manned by our dedicated volunteers, Rachel Walls, Lee Dingain and Sue Healey, with assistance from Alan Martin, and Ken Sutton and Stuart Housden also both helping out for a day. It was good we had so many people helping because we had a large number of visitors to the stand, new faces, past visitors and volunteers and volunteers signed up to our volunteer programme. Birdfair is also a great opportunity to catch up with our supporters and friends at the World Land Trust, Puro Coffee and Serra dos Tucanos. REGUA is now well and truly on the birdwatching map and we are a firm believers that international birdwatching tourism is crucial in helping REGUA carry out our urgent conservation work protecting the Atlantic Forest of the Guapiaçu valley. A huge thanks to everybody who visited our stand and also to all the Birdfair volunteers for making the event run so smoothly. We would also like to give a special thanks to Guto Carvalho of Avistar (the Brazilian Bird Fair) for mentioning REGUA in their excellent talk, and to Rachel Walls for all her hard work behind the scenes organising the REGUA stand each year and for baking her amazing cakes! We look forward to seeing some of you at REGUA soon! If you have any enquiries about visiting REGUA then please drop us a email.